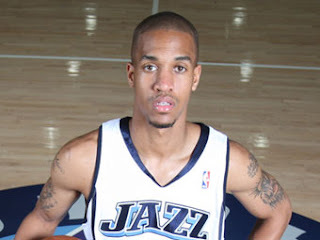 Tonight it was announced that the Utah Jazz have sent Eric Maynor (and Matt Harpring's expiring contract) to the Oklahoma City Thunder in return for the rights to Peter Fehse of Germany, who incidentally has logged as many minutes in the NBA as your's truly. The Jazz have no interest in signing Fehse. It is merely a financial move that will save the Jazz around $10 million in luxury taxes. I'm not surprised that the Jazz made a move to give them some tax relief, but I am surprised that the deal involved our backup PG. Maynor had been a steady contributor, and looks to have a bright future ahead of him in the NBA. In explaining the trade, Kevin O'Connor has said, "the fact is we've got Deron". While it is true that Maynor was never going to challenge Deron for the starting position, one only needs to mention names like Jordie McTavish or Delaney Rudd to understand the importance of a competent understudy at the point. Tim Buckley also referenced the fact that Deron is averaging 38.5 minutes a game to show that Maynor's exit would not substantially affect the Jazz. This stat is a bit misleading, however, since Maynor and Deron have shared the back court often this season, and the combination has been pretty effective. This deal may be most telling in terms of the Jazz's current financial situation. If we are willing to trade one of our best young players to an up-and-coming divisional rival for only financial relief in return, it tells me that the Jazz are 1) really hurting financially and/or 2) have it as their first priority to be a money-making organization first and a championship contender second. If the Blunder were still playing in Seattle I would be estatic over this deal. But, alas, the Sonics are no more and Eric now has to call OKC home. From my two trips to the Tox Box this season, and the myriad of ticket packages that are being offered to try to drum up business, I think the Jazz and many other NBA teams are truly hurting. The Jazz and frugality go hand in hand like Booner and warm root beer. With the auto industry in the tank I can only imagine the Miller's books are in a similar state. Sadly I think we had no choice here. Maynor is solid, which is exactly why we were able to get something real in return for him -- much more flexibility in avoiding the luxury tax. A lot of teams wanted that OKC cap space and we got it. . . Kevin O'Connor deserves some credit there. I don't think it's as black and white as wanting to win vs. making money. The fact is that very few teams can afford the tax and be healthy and competitive long-term, and plenty of teams win it all when they're at or under the cap. We were screwed by Boozer and AK and Portland this summer. . . the Maynor trade is the result of that, but the only one that was really our fault was the AK monstrosity. As a follow-up to yesterday’s trade, I want to personally let you know why we made the decision we did as we value your commitment to the Jazz. 1. Fact: I want the Utah Jazz to win. 2. Fact: The Jazz need to be financially viable in the long run. 3. Fact: Unfortunately, due to Matt Harpring’s numerous injuries, he is unable to play. This means the Jazz is paying $13 million (salary and luxury tax) and getting nothing in return. 4. Fact: I am not happy about trading Eric Maynor. The genesis of yesterday’s trade began last summer when Boozer, Okur and Korver all exercised their option to continue to play for the Utah Jazz. I was surprised, but happy when all three were back on our roster at the start of this season. Portland then made their run at Millsap in the late summer. As a franchise, we believe in Paul and hope he has a long and prosperous career with the Utah Jazz. Because of this, I felt strongly that we needed to make an unprecedented move to match Portland’s offer and keep Paul here. Doing this meant for the first time in franchise history, the Jazz entered the luxury tax realm. To me the reason for this is obvious: Millsap can help us win. It is important to note that from a financial standpoint this is a double negative—first because we have to pay one dollar of luxury tax for every dollar of player salary over the luxury tax threshold and second, because the teams that pay luxury tax forfeit their ability to collect their share of the tax paid by teams over the limit. We entered the season committed to an all-time-high salary expense. We did it with our eyes wide open. I don’t mind paying the luxury tax for healthy players that can help us win, but it is very difficult for me to pay the money and not have the benefit of a player’s services. The trade with Oklahoma City resolved this concern. Having the league’s premier point guard in Deron Williams, and a veteran backup in Ronnie Price, took some of the sting out of this decision. Again, I am not happy about trading Eric Maynor away and truly wish him the best going forward. I appreciate the years Matt Harpring played with the Jazz. His toughness and work ethic are consistent with the values of this organization. Matt will always be part of the Jazz family. My family and I appreciate your continued support of the Jazz and wish you and yours a very Merry Christmas. If you are interested in following me, I'm now posting personal and professional updates at Twitter.com/GregInUtah.